Fall is always a beautiful time for music, and the females of the music industry are killing it these days. From numerous MTV Video Music Awards wins, to tons of nominations for the upcoming MTV European Music Awards, women are racking up awards across the board. There are tons of new songs and albums that need to find their way to your fall playlists, ASAP, because fall playlists featuring female performers are guaranteed to be like a party in your ears. Ladies from all genres have started releasing new music, just in time for a season full of pumpkin spice lattes and cozy knit sweaters. You should be excited about a lot more than fall fashion and pumpkin-flavored everything, and both new and old faces of the female music industry are here to remind ourselves of that fact. New jams are on their way, so make sure your earbuds are clean. We vibed to The Weeknd's Beauty Behind the Madness. We are more than excited for Justin Bieber's comeback album set to release this November. The thought of One Direction's final album dropping this fall before they go on their hiatus gives us all sorts of feels. But time to step aside, boys, the women of music are here to give you a run for your money on the charts. Here is a rundown of seven fierce female acts, both new and old, who you should definitely be listening to this season. If you're a "top hits" kind of person, then you might have stumbled upon FLETCHER. Her latest single "War Paint" is definitely an ode to girl power, and FLETCHER is showing that she can put up a fight with the big dogs. While she might be relatively unheard of for now, that will not last long. Her strong vocals and pop sound will help her rise in the charts. If you're a fan of other newbies like Tori Kelly and Rachel Platten, you should give FLETCHER a chance. This 20-year-old, blue haired, girl-wonder is the edgiest young female musician to emerge since our fave, Lorde. 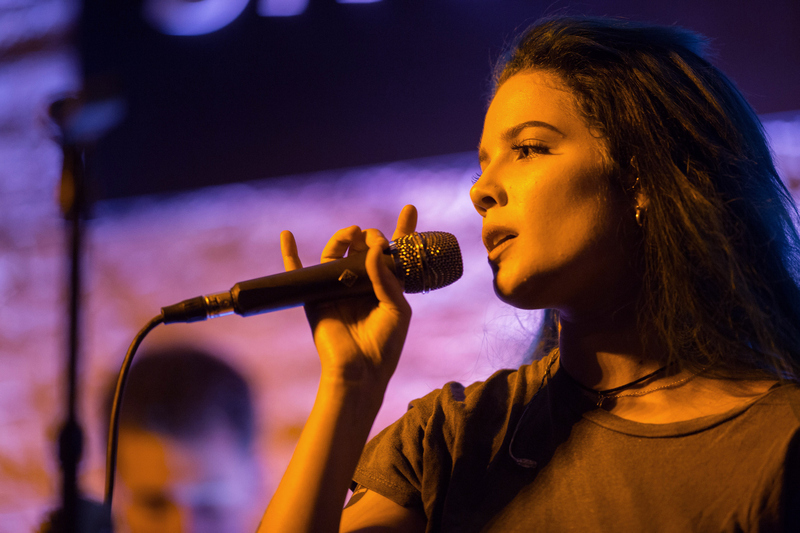 With her unique voice and look, Halsey has developed a strong fan base that goes to great lengths to promote her first full length album, Badlands. After listening to the album in full once, I became obsessed. Her edgy pop sound makes her a standout, and there is no one who sounds quite like Halsey on the charts right now. Make way! She will blow up this season. Selena Gomez is just coming off of a super successful summer, so there is no doubt that this success will roll over into this next season. Her sultry single "Good For You" featuring A$AP Rocky has stayed in the charts for months, and reminded everyone that Gomez is still a force to be reckoned with. A little over a week ago, she released the audio for her next single, "Same Old Love," gearing up for her big fall release of her next album, Revival. Slay, Gomez! Another newbie, but not for long. After appearances on shows like The Today Show, this 16-year-old is slowly growing her fan base thanks to her mature voice and amazing vocal range. Not only is she great for her age, but just great in general. Her single, "Hide Away," from her EP Daya can be found on many "top hits" playlists and should, most importantly, be on yours! I'm warning you now, don't sleep on Daya. She's going to be big, and you want to say that you heard her first. We're all familiar with the sweet voice of Ellie Goulding. Her crazy popular singles like "Love Me Like You Do" and "Burn" have made her no stranger to chart success. Her latest single "On My Mind" just dropped and is sure to be another hit, and her next album DELIRIUM is set to release on Nov. 6. You won't want to miss out on this one. This curly haired cutie is another musician that you will want to know. Her brand new EP Four Pink Walls has several songs that are on music lover's radiuses like "Here" and "Seventeen." Give her a listen, you won't regret it! These four British beauties made their way back on the charts this summer with their super catchy single "Black Magic," and their latest sassy single "Hair." Since then, the girls have been working on other new music for their next album. The group just celebrated their four year anniversary, so it's guaranteed that more catchy tunes are on the way. Their next album Get Weird is set to release later this year, so get ready. Move over, diamonds. Music can be a girl's best friend, too. While the men of music are killing it right now in music as well, the women are releasing major hits. Stay in touch with these seven acts, and stay tuned for other new music on the way this fall.